Annual Maintenance Package - with 33% extra products! Get 33% extra Superfoods in the package. Pay Rs 5990.00, get Superfoods worth Rs 8000.00. 33% absolutely free! Don't put on the weight you lost! Maintain the healthy and fitter you, for life. Know what to consume, under a nutrition expert's guidance, to manage your weight, because you have really worked hard to lose weight, and don't deserve to put it back again. 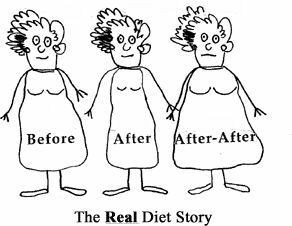 Research has shown 80% of people gain their weight back if diet is not maintained properly. Don't let this happen to you! Enrol in Truweight's Maintenance Package, and don't put on the Kgs you lost. Let us take care of you, and make sure you don't reach this "After After" state. Enrol in your regular lifestyle of maintenance with healthy foods and periodic monitoring with a dietitian. 2 diet counsellings in a year. 8 Vouchers worth Rs.1,000.00 instantly activated and valid for 12 months. Premium superfoods: Extract the benefits of Truweight Superfoods for healthy maintenance. Select from the wide range for your healthy snacking and meals every time. Diet counseling: This will help you be on track, providing valuable health information and clearing all your queries regarding your diet, eating pattern on special occasions, food alternatives or any diet issues (snacking problem or sweets indulgence etc). The counseling with the nutrition expert is your go-to-buddy for any issue especially the moment you see you putting on weight.